Never feel nervous on a stepladder again! No matter how you set it up, the patent-pending Select Step® aluminum a frame ladder provides a comfortable standing platform that offers heel-to-toe foot support at the top recommended step. The AirDeck® workstation with handrail provides extra stability and eliminates feelings of vertigo while standing at the top of the Select Step. The AirDeck lets you focus on your work for better results and helps you work faster without worrying about losing your balance. The heavy duty rated, (Type IA – 300 lbs.) yet lightweight Select Step can be used safely on stairs and uneven surfaces because both sides telescope independently. Hanging pictures or changing that impossible light bulb above the stairwell will never be easier. The Select Step Stepladder is available in 5-8 and 6-10-foot sizes. I am able to move it around an old house with tight spaces and small doors. Ladder is portable and easy to carry! We are very happy with our ladder! We were finally able to set our home up the way we wanted. It has been the most wonderful ladder. We finally got to decorate our hallway, working on the stairs in ease to finish projects! I love the different angels and pitches the ladder can go into! I am able to get closer to the wall by using the feature that allows me to keep one side shorter. I feel a lot safer. I do decorative painting for a living. I have had several jobs that could not have been done without this ladder. I have seen some of the competition ladders that aren't made as well. 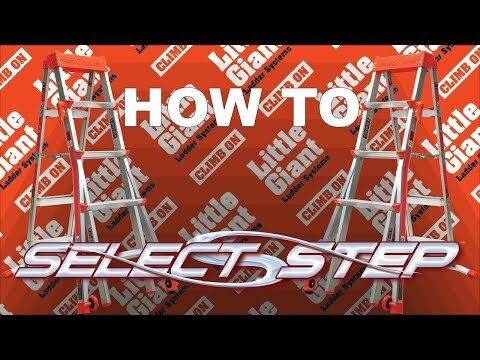 The Little Giant is absolutely the best ladder made!!! A-Frame Min. Height 5 ft. 1 in. 6 ft.1 in. A-Frame Max. Height 8 ft 1in. 10 ft. 1in. A-Frame Max. Highest Standing Level 5 ft. 9 in. 7 ft. 7 in. Storage Height 5 ft 1 in. 6 ft. 1 in. Storage Width at Base 2 ft. 3 in. 2 ft. 8.5 in. Rung Size Single Section Inner: 1.75 in. Outer: 1.75 in. Inner: 1.75 in. Rung Size Double Section 4 in. 4 in. Platform Size 11.75 in. x 9.75 in. 11.75 in. x 9.75 in. Ladder Weight 26 lbs. 32 lbs. AirDeck® Weight 4.2 lbs. 4.2 lbs. Shipping Weight 35 lbs. 44 lbs.